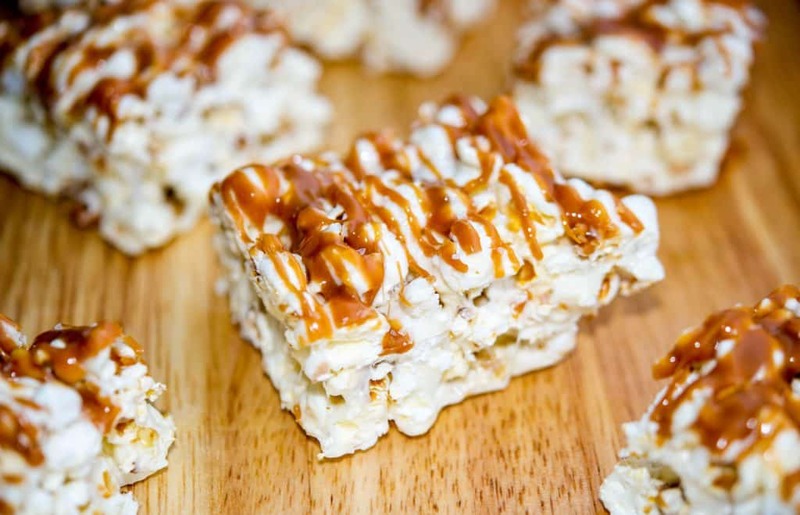 These Salted Caramel Marshmallow Popcorn Treats make the perfect salty-sweet snack the entire family will love. I am a popcorn fanatic. Truly. I would rather eat popcorn over sugary desserts any day of the week. But every now and then I crave something sweet and salty, so when I saw a recipe for marshmallow popcorn treats in May’s Cooking Light magazine, I knew I had to try them for myself and adapted their recipe to make these Salted Caramel Marshmallow Popcorn Treats. For this recipe you can either make your own popcorn, use store bought bagged popcorn or your favorite microwavable popcorn. I prefer popping mine in a little oil on top of the stove. Once the popcorn is popped, allow it to cool while you melt the marshmallows and butter. I like to use my Le Creuset Dutch oven so the marshmallows don’t stick entirely to the sides. Once the marshmallows have melted, remove from the heat so it doesn’t brown; then stir in the popcorn. Next line a pan with parchment paper, then press the popcorn mixture down firmly; making sure it is spread evenly in the pan. I used a 9″ x 11″ pan for these and got 12 bars. It can get a little sticky so I recommend either spraying a piece of parchment paper to help press it down or just spray your clean hands. Since I’ve never made salted caramel before, I found this quick and easy recipe from Sally’s Baking Addiction, but you can also melt down store bought caramels since you only need a small amount for drizzle. If you put it on too thick, it makes it difficult to bite down through the treat. 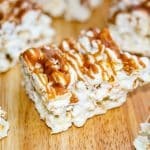 These Salted Caramel Marshmallow Popcorn Treats were the perfect combination of “salty” and “sweet” and my family loved them. 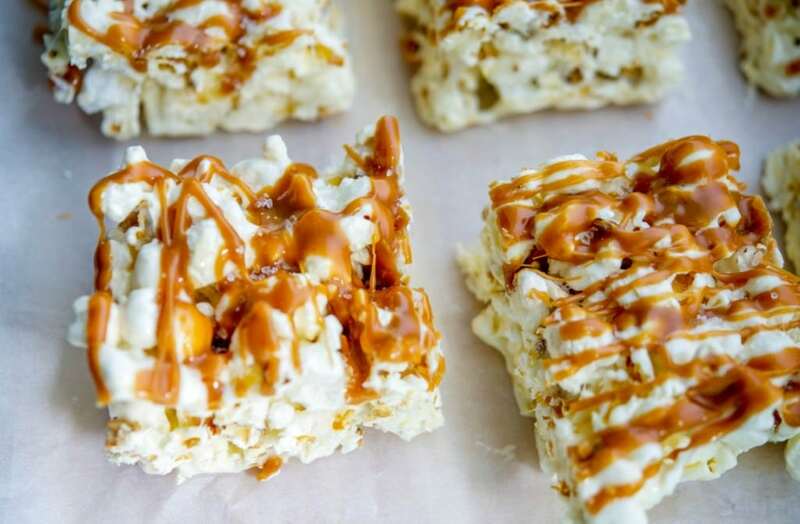 They’re a fun twist on the traditional Rice Krispie Treat and are great to bring for dessert to a picnic or backyard bbq because they’re served individually. I prefer those types of desserts, especially in the summer when you fill up on all of those wonderful salads and sides, but still want to have a little something sweet to finish the meal. ~Enjoy! 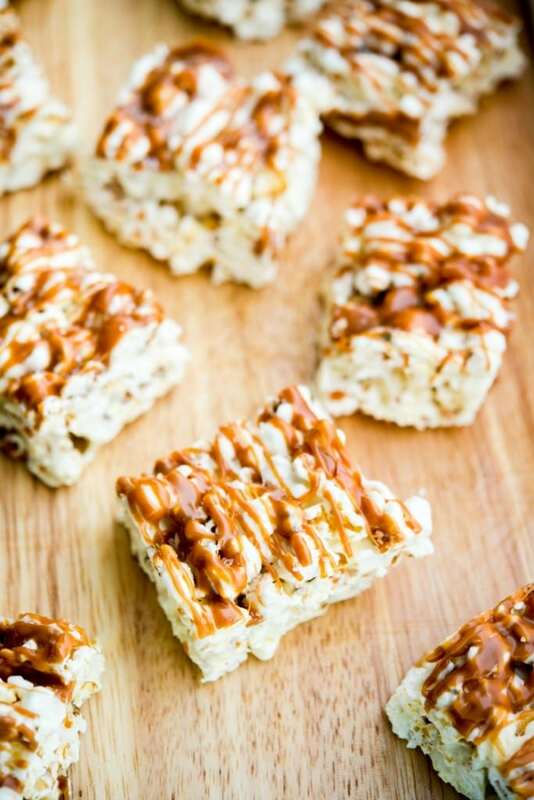 These Salted Caramel Marshmallow Popcorn Treats make the perfect salty-sweet, low-fat snack the entire family will love. 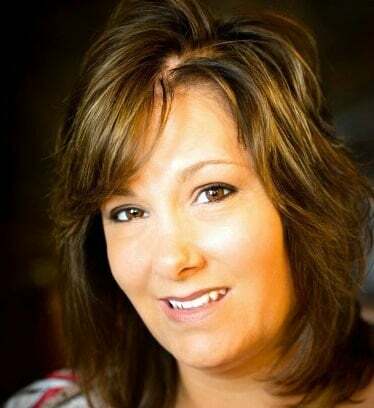 In a large nonstick pot, add butter and marshmallows and melt over low heat until smooth. Remove from heat. Stir in popcorn; then transfer to a parchment paper lined pan (I used 9"x11"). Spread evenly and pat down using parchment paper sprayed with cooking spray. Drizzle prepared salted caramel over the top; then sprinkle the sea salt. Allow to cool; then cut into 12 bars. Carrie, these sound amazing!! I love everything about them- salted caramel, marshmallows, and popcorn- yum, yum and yum! All three together must be incredible! Thanks Sonali and they were incredible. They certainly didn’t last long in this house. Thanks for stopping by!